If a picture does indeed paint a thousand words, it is notable that the torture prevention world remains distinctly word top-heavy. While NPMs and other detention monitoring bodies typically spill ink on paper thousands and thousands of words over, describing their vexing findings and advancing corrective recommendations, the use of pictures in the form of electronic video imagery is not as commonplace as one might have expected. In an Internet and social media-driven world this reality is remarkable. NPMs and other oversight entities routinely issue a range of reports, unleashing them into the public domain most commonly through accompanying backgrounders, press releases and Tweets. What is perhaps anything but universal, is the use of animation and information video clips as a means of propagating key findings and recommendations. The video clip below from the United Kingdom is a relatively rare illustrative case in point. Of the UK NPM’s constituent 21 bodies, the Criminal Justice Inspection Northern Ireland exercises oversight over prisons in the province. 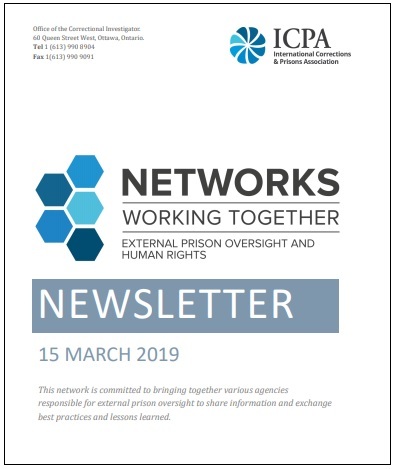 In late November 2018 the mechanism issued a joint report with several other members of the UK NPM of an unannounced inspection visit to Maghaberry Prison earlier in the year. Brendan McGuigan, the Chief Inspector of Criminal Justice in Northern Ireland, took to video to spell out the key findings of the report. Most encouragingly, the Chief Inspector can routinely be seen doing so in relation to the institution’s other key reports. The Paraguayan NPM, Mecanismo Nacional de Prevención de la Tortura, has also produced a series of video clips highlighting both its visits and general preventive activities. Please see the following clip about mental health detention in Asunción. The Kazakh NPM, the National Commissioner for Human Rights, has publicized its more general detention monitoring activities through two video clips (in Russian), which can be watched here. The Senegalese NPM, l’Observateur national des lieux de privation de liberté, has similarly produced several promotional videos. That said, not too many other NPMs appear to be breaking new ground in relation to the dissemination of their annual-, thematic- or visit reports in such a manner or even publicizing their OPCAT-related monitoring activities. If such animation or video clips exist in sizeable numbers, then the Canada OPCAT Project could not find them! Take, for example, the respected French NPM, Controller General of Places of Deprivation of Liberty, which published its 2018 Annual Report this past week on 27 March 2019. The French NPM has succeeded in publishing yet another solid yearly report, albeit one whose key recommendations might have been reinforced through some form of social media/website video clip. Similarly, as discussed in these pages, in late January 2019 the UK NPM published its Ninth Annual Report, seemingly wholly unaided by any such video clip fandangle. The NPM list goes on. Despite the more traditional approach of detention monitors to promoting their reports and wider activities, resort to electronic video imagery is unquestionably worth considering. This past week the Queensland Ombudsman in Australia issued a report into an investigation into a riot in a youth detention facility. As was noted in a recent article, the Queensland Ombudsman may become part of the country’s future NPM. The report was titled The Brisbane Youth Detention Centre report: An investigation into the management of young people at Brisbane Youth Detention Centre between November 2016 and February 2017 and, unusually, its publication was accompanied by a helpful animation clip, which readers can watch below. Even though this super little video clip would never win any glittering prizes at Cannes, it achieves exactly what it sets out to do. After watching the three-minute or so clip, the viewer comes away with a good insight into the thrust of this newly published report. Meanwhile back in Canada, not as yet part of the ever-growing OPCAT family, a few weeks ago this website threw a spotlight on an excellent report by the Ombudsperson of British Columbia. The report cast a long, dark shadow over the efficacy of fundamental detention safeguards in the province’s mental health institutions. If you did not have time to read the report, you could have watched the following animated video clip (on the bus or train traveling to work for example). The clip successfully captures the gist of the report in less than two minutes. Having said that, the use of the moving image to complement the static word appears to be a new approach for the Ombudsperson of British Columbia. Somewhat surprisingly, other Canadian oversight bodies do not appear to be following suite, be it for reasons of cost, time or in-house expertise or perhaps even skepticism about the added value of resorting to such tools. Take, for example, the recently published joint report by the Office of the Correctional Investigator and Canadian Human Rights Commission titled Aging and Dying in Detention. There was not an accompanying video clip in sight. Similarly, a February 2019 report of the Ombud New-Brunswick titled Failure to Protect, focused on the deliberate physical abuse of patients in a care facility in the province. The report was also not accompanied by any such digital promotional materials. The two emerging reports from out of the joint investigation of the Manitoba Ombudsman and Manitoba Advocate for Children and Youth into the use of pepper spray and solitary confinement in youth correctional facilities in the province, as highlighted on this website, adopted the same standard promotional approach: a report accompanied by a press release. While all of the above are very well presented, expertly written reports, could the size of their respective media splashes or public outreach have been greater with the use of a cleverly produced animation or information clip? In an era when ever greater numbers of us are addicted to the Internet and social media and are seemingly developing ever shorter attention spans, the use of such electronic Internet and social media tools might have a useful practical resonance. After all, throwing a bright spotlight onto what is happening in detention is at the very heart of the independent oversight function, arguably more so in view of the OPCAT. Civil society – a step ahead? Unsurprisingly, civil society has long since understood the power of digital imagery. The Association for the Prevention of Torture, for instance, has had its famous promotional OPCAT animation clip transformed into an impressive 21-language versions. Thus, whether you are a Thai, Hungarian or Arabic speaker, you can learn more about this key torture prevention instrument in your language of choice (check them out here). As a result, French-speaking Canada, Belgium or Switzerland are all able to watch the following OPCAT animation in their French language of choice. This author’s personal favourite promotional OPCAT video clip was produced by the highly respected Irish NGO, the Irish Penal Reform Trust. It was also featured in an article on this website earlier this year, focusing on Ireland’s much anticipated, but long delayed ratification of the OPCAT. 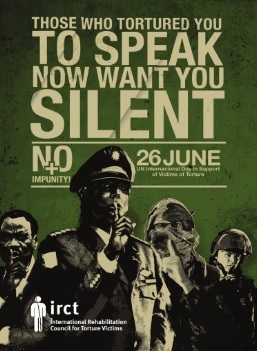 Whether it is the poignant music, the simple but ingenious design, the stress on the acute vulnerability of certain categories of persons in detention, or the Irish Government’s inexcusable dragging of feet to ratify the OPCAT, the IPRT’s animated video clip pushes all the right buttons as a promotional tool. If you exchanged Ireland for Canada, the thrust of the clip would arguably be equally as powerful in the North American context. Regardless of the Irish (and equally the Canadian) Government’s unimpressive foot-dragging on OPCAT ratification, the use of animation and other information clips remain a persuasive tool, whether for projecting an advocacy campaign or just a simple point of information. Furthermore , they represent a surprisingly under-utilized means of conveying to a wider audience the key content and any related recommendations of a given report. For detention monitors of all stripe they remain an avenue meriting further exploration. Even the UN Subcommittee has got in on the act! The work of the UN Subcommittee on Prevention of Torture has been showcased in the following OHCHR animated video. However, to date, none of its published reports (annual, country visit or advisory visit focused reports) have been subjected to the same treatment. Please see for yourself! Do you know of any video clips commissioned by NPMs or other detention monitoring bodies? Please contact us and we will add them to this post. Check out Electronic OPCAT for other related torture prevention videos. Please also see the Canada OPCAT Project’s gallery of static torture prevention images.